The Library is hosting March BOOK Madness in which faculty, staff, and students vote weekly to determine the ultimate champion book. 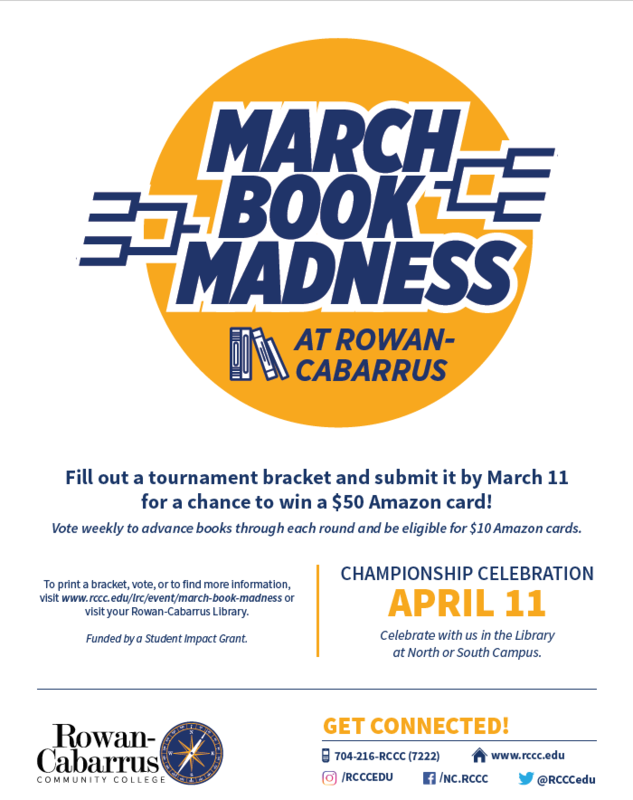 Starting with Round One on March 11, 2019 the field will be narrowed down with another round of voting each week until we celebrate the champion book on April 8, with food, prizes, and fun in the Library on North and South Campus. Voting for each round will be open Monday – Thursday, and two weekly winners will be drawn on Friday from participants in that round of voting. To be eligible for the grand prize, you can also participate in our Bracket Challenge by completing a bracket predicting the winners. All completed brackets must be turned in before March 11, 2019. The winner will be drawn at our celebration on April 8, 2019. The top ten winning submissions will be enter into the drawing for the grand prize! Go to http://rccc.libsurveys.com/MarchBOOKMadness weekly to vote, making you eligible for the weekly prizes. Remember! – Be sure to print off a bracket and submit it by March 11, 2018 to any campus Library! This event is generously funded by the Rowan-Cabarrus Foundation through a Student Impact Grant.